The bottom line is that you are not going to please everyone, and you most certainly are not going to manage to invite everyone to your wedding. Not to be blunt about it, but you’re probably going to agonise over the guest list for at least a couple of weeks, whilst deciding just who does, or doesn’t come to your wedding. Begin with a list of who you definitely want to and should invite, because there is a certain etiquette involved in the wedding list to which one adheres, give or take a few extended relatives. social friends – those with whom one plays sport, or does yoga/tai chi, book club etc. You and your fiancé will have a definite idea of who not to invite to your wedding, although these choices may not always coincide. Iron out which relatives, friends, children, or co-workers you would rather not have attend your wedding, as this decision will, in turn, affect just who you can invite. Have a well-rehearsed answer that goes something like – we’d love to have a huge crowd at our wedding, but we’ve decided to go for a smaller gathering due to (any one of these): our venue is really teensy so there isn’t enough room for everyone; we’re paying for the wedding ourselves so our budget is limited; wanted to keep it intimate and there are thus quite a few of our friends and family who won’t be there on the day. Be honest. 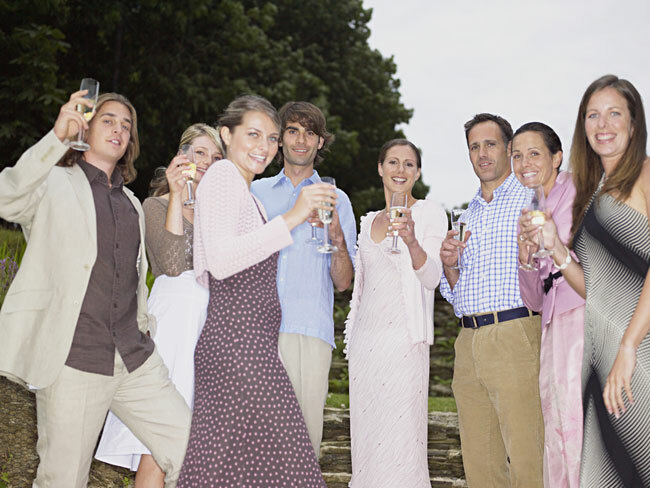 If someone you would love to have at the wedding suddenly wants to bring along their partner, whom you don’t even know, just be frank and say that you want to be surrounded by only your closest friends and family. Hopefully you won’t have anyone query your decision, but if you do, one of the above, or a combination of the two should get you through the ordeal unscathed.